Liquid alternatives have seen strong industry growth, outpacing traditional hedge funds, according to “Going Mainstream: Developments and Opportunities for Hedge Fund Managers in the ’40 Act Space,” an April 2014 study by Barclays Prime Services. The study found that in 2013, liquid alts assets grew by 43%, while hedge fund assets grew 15%. 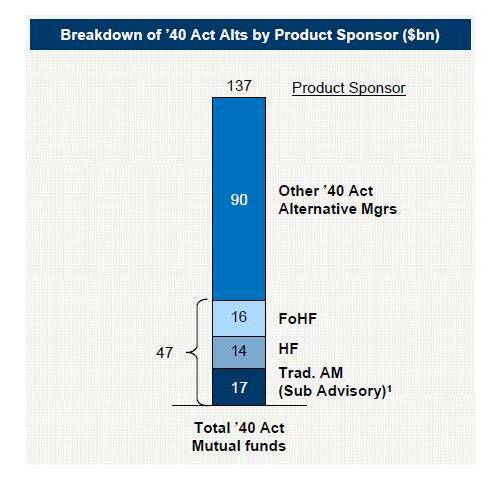 Assets in ’40 Act alternative funds now stand at $137bn. The graphic above shows that the majority of assets have been raised for products that have been brought to market by a non-hedge fund sponsors. That is the commercial success in raising assets can be as much about the strength of the distribution capabilities as the underlying fund profile and returns. ’40 Act Fund flows have grown to the extent that net flows to these liquid alternatives has started to be significant relative to flows to offshore and onshore hedge funds (graphic below, lhs (data to Feb2014)). In the next twelve months flows to ’40 Act versions of hedge fund strategies could well overtake investor flows to all the other legal formats for hedge fund strategies (LLPs, offshore funds and UCITS). In terms of the underlying assets in ’40 Act hedge funds, the majority are still managed by traditional asset management companies. The right-hand graphic above shows that traditional asset managers and hedge fund firms have both enjoyed an acceleration in AUM. The difference in CAGR shown above is largely accounted for by the low starting point for hedge fund management companies – four years ago hedge fund management companies did not have the distribution arrangements in place that they do now. Another inference is that amongst the winners in asset gathering in ’40 Act funds will be traditional asset management companies, some of which have investment management capabilities every bit as good as specialist hedge fund companies, but which have much more seasoned marketing and sales staff for the channels being used in this sector. 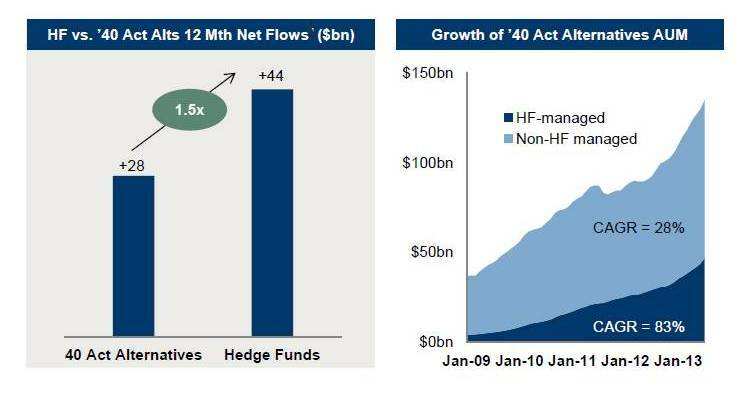 Hedge fund strategies in ’40 Act fund format have plenty of room to grow. Liquid alts make up only 1%, or $137 billion, of the $13.2 trillion U.S. mutual funds industry. The authors of the Barclays study estimates that liquid alternatives assets will reach $650 billion to $950 billion by 2018, which is at least a five-fold expansion in four years.